L. Frank Baum’s fantasy novel The Wonderful Wizard of Oz has proven a malleable property over the years. Of course everybody knows and loves Victor Fleming’s 1939 film adaptation, then came the urban-set musical revision The Wiz, the villain’s-eye-view retelling Wicked, Sam Raimi’s limp-noodle Oz the Great and Powerful, NBC’s crazytown new gritty-reboot series Emerald City, not to mention the dozens of films that have paid homage to the timeless scenes of Fleming’s film. (The bit in O Brother, Where Art Thou? when our heroes sneak into a KKK meeting like it’s a Winkie stronghold is a particular standout.) And today brings the news that the merry old land of Oz will get yet another new spin, and this time, there will be blood. The Hollywood Reporter has the exclusive that New Line has purchased a horror script from up-and-coming screenwriter Mike Van Waes that refashions the story of Dorothy Gale and Toto lost in Oz as a gory tale of terror. Regrettably, the THR item doesn’t provide much more detail than that, but knowing New Line and the slate of films they‘ve fronted in the past — such lucrative franchises as The Conjuring, A Nightmare on Elm Street, and Friday the 13th — we can make a stab (pun intended) as to what audiences can fairly expect. 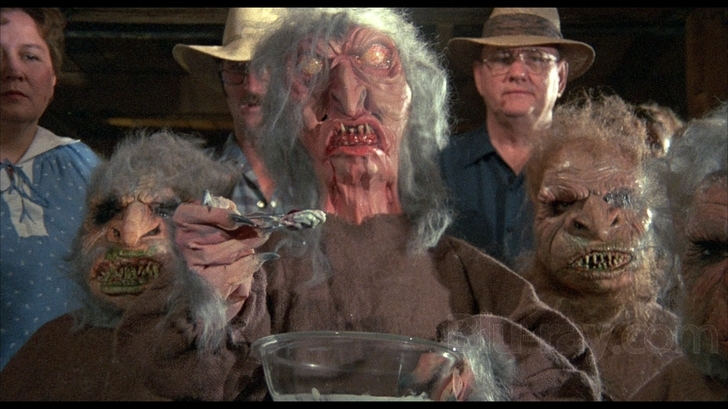 Rabid, teeth-gnashing flying monkeys dive-bombing Dorothy and clawing at her hair, a Witch with her sinister potential fully realized, Winkies that look like the little dudes from Troll 2. Come to think of it, The Wizard of Oz has inspired enough surreal childhood nightmares that it pretty much qualifies as a horror film already, no?